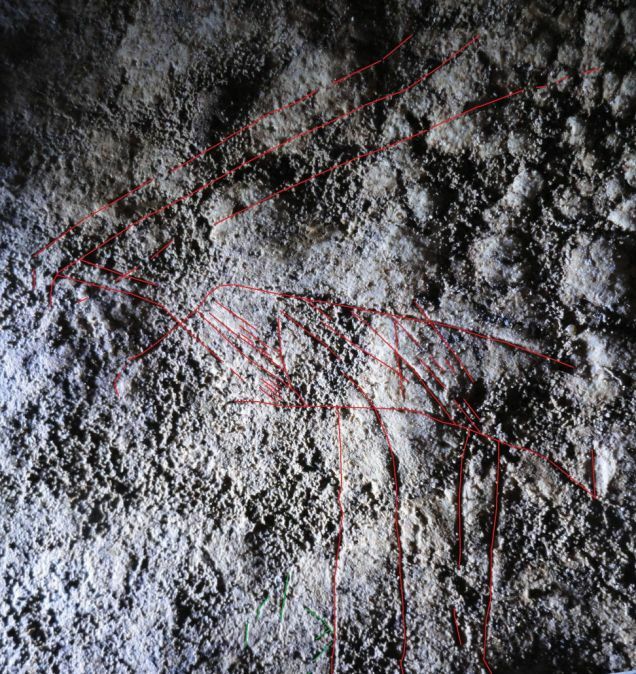 Archaeologists believe a wall carving in a south Wales cave could be Britain's oldest example of rock art. The faint scratchings of a speared reindeer are believed to have been carved by a hunter-gatherer in the Ice Age more than 14,000 years ago. The archaeologist who found the carving on the Gower peninsula, Dr George Nash, called it "very, very exciting." Experts are working to verify the discovery, although its exact location is being kept secret for now. Dr Nash, a part-time academic for Bristol University, made the discovery while at the caves in September 2010. He told BBC Wales: "It was a strange moment of being in the right place at the right time with the right kit. "For 20-odd years I have been taking students to this cave and talking about what was going on there. "They went back to their cars and the bus and I decided to have a little snoop around in the cave as I've never had the chance to do it before. "Within a couple of minutes I was scrubbing at the back of a very strange and awkward recess and there a very faint image bounced in front of me - I couldn't believe my eyes." He said that although the characteristics of the reindeer drawing match many found in northern Europe around 4,000-5,000 years later, the discovery of flint tools in the cave in the 1950s could hold the key to the carving's true date. "In the 1950s, Cambridge University undertook an excavation there and found 300-400 pieces of flint and dated it to between 12,000-14,000 BC. "This drawing was done with the right hand and the niche is very, very tight and the engraving has been done by somebody using a piece of flint who has drawn a classic reindeer design. "My colleagues in England have been doing some work in Nottinghamshire at Creswell Crags and got very nice dates for a red deer and one or two other images of around 12,000-14,000 BC. The limestone cliffs along the Gower coast are known for their archaeological importance. The Red Lady of Paviland, actually the remains of a young male, is the earliest formal human burial to have been found in western Europe. It is thought to be roughly around 29,000 years old. It was discovered at Goat's Hole Cave at Paviland on Gower in 1823 by William Buckland, then a geology professor at Oxford University. Dr Nash added: "We know from the glacial geology of the area this was an open area just before the ice limit came down from the glaciers 15,000-20,000 years ago and it stops just about 2km short of the cave site. "We know hunter fisher gatherers were roaming around this landscape, albeit seasonally, and they were burying their dead 30,000 years ago and making their mark through artistic endeavour between 30,000 and 40,000 years ago." The find is now being officially dated and verified by experts at the National Museum of Wales and Cadw. Its location will be revealed to the public in the future.